Juma Khan was forced to migrate from North Waziristan to the city of Peshawar, and a few years later, to the outskirts of Islamabad, just to make a living. He was born in Pakistan to refugee parents from Afghanistan, and despite having spent 38 years in Pakistan, was still tagged as a refugee. He was illiterate, had no skills, and had adopted the occupation of his parents, who were trash pickers. Juma Khan had been forced into this unpleasant job; it was his only source of income. His younger brother also worked as a garbage picker to support the family’s meager income. Juma Khan got infected with tuberculosis 10 years ago; he assumed that he had been cured, but in reality, only his symptoms had been treated at that time, not the disease itself. He was also unaware of the chronic and progressive effects of the disease. His only concern was to be able to support his family of 7 children, the youngest aged 3 months, as well as his wife and mother, who were chronically infected with hepatitis C. He survived by rummaging through trash day after day, as he suffered from episodic fever. He was also addicted to ‘naswar,’ the East Asian version of snuff, a type of dipping tobacco that originated from a variant of a dry form of snuff in the 19th Century. It is a moist powder tobacco that is placed under the lip for an extended period of time and is consumed mostly in Iran, Afghanistan and Pakistan. Juma Khan’s eyes best narrated his story of suffering and despair. Lying on a blood-soaked sheet, he had had a tough life in which work had taken priority over health; he did not seek treatment for years until he collapsed, throwing up blood and being hospitalized. He was diagnosed with haematemesis, a medical emergency which requires immediate hospitalization.A patient with haematemesis vomits significant amounts of blood, which may lead to shock. Khan was also diagnosed with liver cirrhosis. His tests revealed that the latent tuberculosis had progressed from an underlying infection to active cirrhosis of the liver. He had complained of fever, weakness, loss of appetite, and fatigue for years. Cirrhosis is a potentially life-threatening condition that results in inflammation and scarring of the liver. Khan was told that no treatment would cure the disease or repair the damage to his liver. He was placed under observation and administered drugs. Liver transplant was not a possibility as he was not considered a suitable candidate for the procedure, and even if he had been a candidate, the availability of a compatible liver was a remote hope. 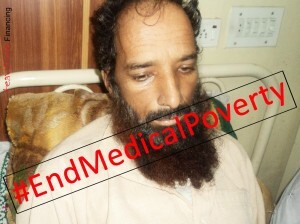 Sharing his plight, Jumma Khan said, “I was not recognized by the society. I had been forced to take up garbage picking as a job. I had no security of any kind.” He knew that his occupation was hazardous and felt that he must have acquired the disease from the garbage he rummaged through every day. His occupation resulted in ostracism and prejudice, topped by social rejection. He continued to be treated as an outcast, a refugee, and an alien, totally unwanted. He had often been harassed and threatened by the police and driven away from garbage piles. Although he was not valued by society, he continued to work in dumping grounds from morning to evening, seven days a week. Juma Khan lived near a dumping ground with no water or sanitary facilities. He had no security regarding his livelihood; he had been toiling in the waste since he was four years old. He talked of a lost childhood, surviving on a meager income, unable to afford medical treatment, and burdened by a heavy loan. He claimed having little hope for a better future or recovery, and felt that his hospital bed might be his last home before the grave. Khan’s world was bleak. Heartfile intervened to revive some hope in Juma Khan’s life. His case was disturbing at so many levels. It highlighted the social disparity rampant in Pakistan, where the rich and the mighty stand on the sidelines watching the poor and under-privileged suffering in front of their eyes. Who cares if the system serves a dastardly purpose, forcing on some, a life ridden with filth, disease and social disdain?